﻿ Bosch Compact Mixer MUM4405 Review: Puny and Flimsy? Bosch Compact Mixer MUM4405 Review: Puny and Flimsy? Can you have a low-priced mixer that can do almost anything you want it to do, including bread? Read that again: including bread. Yes, you can. It may not be as chic as the more popular stand mixers, but if you’re after efficiency at a very affordable price, this compact mixer may just be what you’ve waited for. See the Bosch Compact here. There are other reasons users favor this Bosch stand mixer…a small footprint, portability and toughness. If you haven’t tried one or researched about it, don’t dismiss it yet. In fact, I strongly encourage you to read this detailed Bosch Compact Mixer MUM 4405 review which includes features and benefits, performance, capability, durability, where to find the best price and our final verdict. What Can the Bosch Mum 4405 Mixer’s Power Do? How Well Can it Handle Tough Dough? What Are the Features of the Bosch Compact Mixer? How Efficient And Dependable Is this Compact Mixer? What Are The Pros and Cons of This Bosch Mixer? Should You Get the Bosch MUM4405 Mixer? Most of us will look at a mixer’s power first when sizing it up. But, just knowing this metric is useless if you don’t know what it can do. You just want to know if it’s enough for the tasks you require of it. This Bosch stand mixer is loaded with a 400-watt motor. Without doubt, it can mix cake batters and cookie dough, mash potatoes, cream butter and whip cream. But, the pleasant surprise about this compact mixer is that it can mix and knead bread dough better than some bigger and more expensive stand mixers. Use it to make basic white bread, whole wheat bread, bagels, rolls, sourdough and so much more. How it performs with dense mixtures is where the Bosch compact surprises and excites. I had this mixer before and I agree with most users that it hardly flinches. You can have it knead for much longer than KitchenAid stand mixers and it does not overheat even with extended kneading. One user had it knead for 15 minutes! It can process all types of tough dough in small batches…whole wheat, brioche, white bread, pizza dough and even stiff bagel dough. This is a good fit for someone who makes modest amounts of bread like 2 -3 loaves per batch. In addition to a 400-watt motor your Bosch compact is equipped with several features that make it a versatile and dependable kitchen appliance. Continue below for detailed descriptions of each feature. The power drives are where attachments and accessories are coupled. The speed requirement determines the type of drive to use. High Speed Drive. This power drive is used for attachments that require high shaft speed such as a blender. Mid-Speed Drive. This is where the continuous shredder attachment is coupled. High Torque Drive. Use this drive for dough hook, whisks and meat grinder. On/Off. Turns the motor on or off. Park. This is indicated by the “P” mark. You have to park the drives before changing the position of the multi-function arm by turning the switch to “P”. 4-Speeds. Speed settings are labelled 1, 2, 3 & 4, form lowest to highest speed. The speed to use will be determined by the type of mixture and attachment you are working with. Speed settings can be used with all accessory drive types. The three accessory drives are located on the rotating arm and can be accessed depending upon its position. Each ergonomic positioning locks in place and corresponds to the attachment or accessory to be used. Horizontal Position. The mid-speed drive is located on top of the arm in this position. Remove the drive cover and attach the continuous shredder in the drive. Up Position. This should be the position of the arm when attaching and removing whisks or dough hook. Place it on the horizontal position to begin using. Down Position. In this position you can access the high-speed drive on top of the cylindrical shaft. Remove the cover and attach blender to begin using. Push the release button down each time you move the arm from one position to another. The high-speed and mid-speed drives must always be covered when not in use. The power cord can be wound on the holder located on the back of the unit. Four rubber feet keeps the machine stable and in place when running. It also separates the unit from the surface to minimize noise and vibration. This Bosch stand mixer works well with all common mixing jobs…cake batters, cookie dough, creaming butter, whipping egg whites, bread and pizza dough, etc. I can also be used for mixing meat loaf and mashing potatoes. You almost don’t have to scrape the sides of the bowl because it picks-up mixture efficiently with its planetary mixing action. It does not overheat with extended mixing and kneading. You will find that it is steady, stable, does not shake or vibrate. The beating whisk is for light mixtures like sauces, cream, egg whites and thin batters. The stirring whisk is intended for light cookie dough and cake mixes. The dough hook is for mixing heavy pastry and cookie dough or for kneading yeast doughs. Use it also for adding chocolate chips, dried fruits, nuts, hard butter to batters. 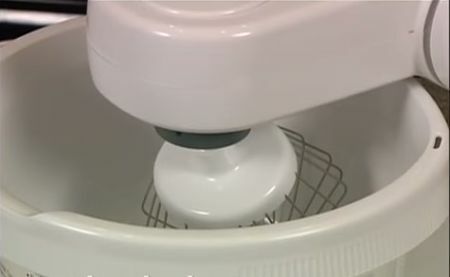 The plastic anti-splash shield should always be used when operating your mixer because it prevents flour and other ingredients form escaping. More importantly it protects from accidental contact with moving parts. Although it has a funnel for when adding ingredients, you may remove it when doing so if you want. You can extend the versatility of your Bosch mixer with the blender and shredder attachments which can be purchased separately. Or, you can just get the Bosch MUM4420 UC package because it already includes these attachments plus an accessory holder. The blender is for blending solid and liquid ingredients or for processing breads, nuts or fruits. Its cover has a funnel closure through which you can add liquids. It can be removed when adding solids. This Bosch mixer is so compact it doesn’t take up much space. It’s light enough to be carried or moved around or even hoisted up for storage in overhead cabinets. Those with weak arms or arthritis will find its size and weight so convenient. The numbers say it all: 72% of reviewers on Amazon give the Bosch MUM4405 five (5) stars! Another 14% rated it 4 stars. Only 5% gave it 1 star and 4% handed it 2 stars. That’s an overwhelming vote of approval. Moreover, the reviews, both positive and negative, are believably genuine because the reviewers give details of their experience…how much, how long, what types of mixture, what they observed and the results. They don’t just give generalizations like “amazing’’ or ‘’great’’. The best place to go when you buy a Bosch mixer is on Amazon. They have the best price and their buyer protection is superb. Prices vary at different times from just a bit over $150 to almost $200. It’s cheap for a stand mixer that gets the nod of majority of customers. Attachments are also available on Amazon. The continuous shredder is over $100 and the plastic blender is almost $50. Simply put: nothing can beat it when you consider performance, efficiency and capability versus cost. This is a wise choice If you only use a stand mixer for small to medium quantities of anything. It may be small, compact and unattractive, but it has other functions right on your fingertips which eliminate the need for other kitchen machines. What’s more impressive is it beats other bigger more expensive stand mixers. See this cheap Bosch compact mixer on Walmart. Take note, however, that although it works well for bread dough in modest amounts, it is not for serious bread making. If you want a Bosch for that purpose, consider the Bosch Universal Plus kitchen machine. We Compare KitchenAid Stand Mixers:Which Is The Best? KitchenAid Professional 600 Stand Mixer Review: Bad For Bread? KitchenAid Artisan Series Mixer Review:Not Worth The Fame? 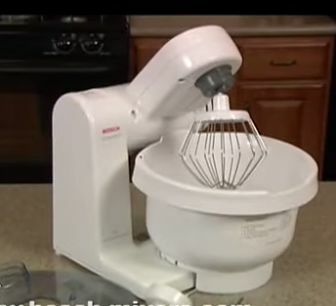 KitchenAid Heavy Duty Mixer Review: Not Heavy Duty? KitchenAid Professional 6000 HD Review: Not Enough Power? We Compare KitchenAid Stand Mixers: Which Is The Best? KitchenAid Ultra Power vs Artisan: The Same Mixers? © 2015 – 2019 Mix It Bake It All rights reserved.